CREEPING fascism speeded up significantly last week as Home Secretary David Blunkett set in motion the measures that will introduce compulsory identity cards and started arresting the families of suspected “terrorists”. But the widening rift in the ruling class also became more evident as parts of the bourgeois establishment took unprecedented measures to thwart the Blair government at home and abroad. The judiciary released a north African suspected terrorist after two years in prison without charge. Home Secretary Blunkett responded by seeking to change the law to stop this happening again. And 52 retired members of the Diplomatic Corps sent Prime Minister Blair an open letter criticising him for allowing Britain to be dragged along on the coat tails of Bush’s warmongering policies and worsening the crises in Iraq and Palestine. The judiciary and the Diplomatic Corps are not left-wing anti-imperialists. They are very much a part of the British state and British imperialism. They are ringing alarm bells because they fear this country is being dragged into an extreme right-wing US global empire with Blair playing the clownish Mussolini to Bush’s world-conquering Hitler. The whole operation is taking place under the excuse of a war against terrorism. They have blown up the significance of Al Qaeda out of all proportion – a small organisation of Islamic extremists who do not represent the vast majority of Muslims — into a monstrous all-pervading, ever-present evil. This gives the imperialists the excuse to tear up all human rights, to persecute anyone they don’t like and to use brute force and bombs to rob and plunder Third World countries and try to enslave the world’s working class. ID cards will not stop terrorism. Blunkett admitted they did not protect Spain. But they will allow the ruling class to monitor and control the movement of workers, especially migrant workers. Every holder of an ID card will have to inform the authorities whenever they change address; otherwise the system cannot work. They will be used as an instrument of division and discrimination, to create second-class citizenship – and they will give a field day to corrupt police and civil servants and the private computer companies who will make a dog’s breakfast of the whole system. People will be denied their rights to healthcare, benefits and pensions because of mistakes in the system or because they have second class ID cards (“visitor” or “guest-worker” cards) or none. The terror suspect released last week (if the state intelligence services could not produce any serious evidence after two years he must be innocent) reports that other prisoners held without trial in the maximum security wing at Belmarsh are suicidal because they fear the world has forgotten them and they will never be released. Meanwhile Blair announced his intention for a complete restructuring of our immigration policy. Basically it boils down to encouraging skilled workers from the new European Union states to come here and fill gaps in our workforce while discouraging any who might need any help. This brain drain will do untold damage to the economies these new EU states but it’s cheaper than employing enough teachers in Britain to produce our own skilled workforce. It will also help the ruling class to keep the workers divided, as the better-educated newcomers will get good jobs. Blair has tried to dismiss the criticisms of his foreign policy by the 52 retired diplomats, dismissing them as “Arabists” and the “Camel Corps”. If Blair had a fraction of the honour or self-respect of most of his predecessors he would have resigned last year. He is still hanging on, unable to admit his colossal blunder in backing Bush over Iraq. Even he must realise he cannot go much longer and his idol Bush is also likely to go soon. Like a snooker player who knows he has no winning shots left, Blair is aiming only to make things as difficult as possible for his pro-Europe enemies before he goes. Now more than ever it is time for the working classes of the world to unite and support each other: in the Middle East, the Third World, Europe and the United States. We are all being screwed by global imperialism. They get away with it by dividing us against each other. Now they are divided there is a chance for us to bring them down and build a better world of peace and socialism. May Day on the march! WORKING PEOPLE all over the world are celebrating May Day this week. In every continent, millions upon millions of working people are raising the Red Flag in honour of the international working class holiday that is the spirit of determination, solidarity and resistance. On May Day working people unite across the globe to demonstrate the solidarity of the class and demand an end to exploitation. In the socialist countries it’s a people’s holiday marking the gains of the revolutions that swept out the hated old order in China, Korea, Cuba and Indo-China. In Africa, Asia and Latin America it’s the call of the oppressed masses in the fight against imperialism and their local hirelings. And in Britain and the other heartlands of imperialism it’s the rallying point of organised labour in the struggle for peace and socialism. We raise the Red Flag to honour those dark days of the 1880s when American workers united against grasping employers who would have them work all day, every day but Sunday for a miserable pittance of a wage. We remember the fight for the eight-hour day and the struggle that took place in Chicago in 1886 that ended with workers gunned down in the street by the police and their leaders hanged on trumped-up charges of conspiracy and murder. We march with the masses all round the world heralding the new era that will end capitalist exploitation once and for all. The path that the Chicago martyrs trod was followed by millions in the years that came to pass. Russia’s workers and peasants took up the gun to end Czarism in 1917 and founded the Soviet Union. They beat off the White Guards and the imperialist armies in the civil war and fought tooth and nail to defeat and destroy Nazi Germany in the Second World War. We remember the Chinese, Korean and Vietnamese people who defeated Japanese and US imperialism to build a better tomorrow in Asia and the countless millions who fought for freedom in the struggle to smash the old colonial system that enslaved so much of the world in the last century. 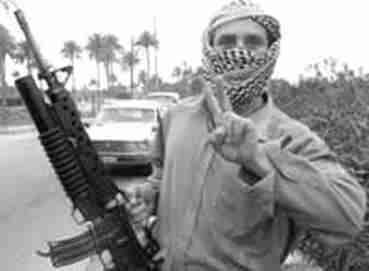 Now, as the guns blaze in Iraq, we stand side by side with the heroic people of the resistance defying the might of Anglo-American imperialism in the streets of Fallujah. Imperialism wants war because that is the only way it can preserve its rotten system of corruption and oppression. Now the spectre of defeat hovers over their legions just as the spectre of communism haunts the exploiting classes in every corner of the world. Imperialism is brutal and oppressive because that is the only way it can ensure that the rich can continue to live the lives of Roman emperors on the backs of workers and peasants. Imperialism fears and loathes organised labour because it knows that the entire wealth of the world comes from workers in the factories and the peasants in the fields. Imperialism fears the spirit of May Day because it represents the unity of working people that sooner or later will sweep the whole rotting system to the oblivion it richly deserves. “There will come a time when our silence will be more powerful than the voices you strangle today”. Last words of August Spies, one of the four Chicago labour leaders executed by the American ruling class in 1887.